In addition to turning your placenta into capsules, we also provide you with a placenta tincture at no additional fee! 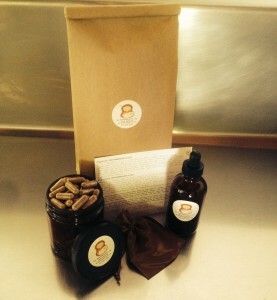 Placenta tincture is an added bonus in that it can be used in addition to and long after the capsules are gone. By tincturing some of the powdered placenta in a high grade alcohol, you can increase the length and benefits of your placenta for both mother and child. The tincture has been used in times of trauma, transition, emotional distress, hormonal fluctuations, all the reasons you would use your capsules and for mother later in life during menopause and even turned into a homeopathic remedy! If you are interested in having enough placenta tincture to last the lifetime of mother and child, you can continue to add 100 proof vodka to the bottle. It was taught to me by a client whose Japanese father had been tincturing many different things throughout his life. Some believe this method will dilute the tincture, but according to the man’s method, by adding a little more alcohol to the already potent tincture, the large amount left in the jar infuses the small amount of new vodka added. – 7-10 drops of tincture can be put in a small glass of water or juice and drunk by the mother during times of transition, trauma, hormonal fluctuations, etc. after her placenta pills are gone or alternating between the capsules. – 3 – 5 drops can be given in water, juice or food to the child when they are sick, getting sick or in a time of physical, emotional or hormonal transition. Teething, growth spurts, weaning, introduction to new sibling, first day of school, puberty, all examples of times when the tincture may help. To make into a homeopathic remedy, take the sample of the strained placenta tincture to your Naturopathic Doctor or Homeopath and ask them to make it into at least 6C potency remedy for you or follow the directions found here to make the remedy yourself. Once the tincture is diluted down to a homeopathic potency, it will be a constitutional remedy for the baby throughout her/his life. It could be used for many/any constitutional or unusual ailments except when a specific remedy is more appropriate (example: arnica is specific for bruising). The placenta contains all one’s strengths and weakness so treating the child with this remedy will provide balance when there is imbalance. It is like their personal reset button. The 6C remedy could be used to promote general health, boost immunity, strengthen and balance the child. It may be given twice a day for a child who looks run down, pale, or their appetite needs a boost. It can be given four times a day if the child seems to be coming down with something, has a runny nose or cough, etc. It can also be taken as needed for times of transition or stress like colic, teething, weaning, separation anxiety, 1st day of school, etc. For more chronic conditions such as autism, cancer or significant injury, a higher potency like 40C or even up to an M dilution would be necessary. This would need to be done with the help and oversight of the child’s naturopath. The information on this page has not been evaluated by the Food and Drug Administration. The services offered are not clinical, pharmaceutical, or intended to diagnose or treat any condition. Families who choose to utilize the services on this page take full responsibility for researching and using the remedies. I had my placenta dehydrated and received a tincture as well. My daughter is 19 months and still breastfeeds. I just got my period back and my supply has dropped dramatically. I am curious if my tincture can help boost my supply. It wouldn’t hurt to try Rachael. It can be good for all of the same benefits you received from your capsules. Hi Rachel, I was just wondering if the tincture helped with your supply.